Beneath a dense black ledge of clouds a full moon hoists itself above the horizon, revealing the best place to cross the swollen rivers. We can’t believe our luck. The downpour that has assailed us since dawn has stopped just in time for our trek along this deserted beach. There are four of us following our guide, Jorge: myself, my partner David, and our close friends Heather and Eric. Jorge has gone on ahead and we’re to follow if and when he signals with his flashlight. Fringed by a jungle of palm trees on one side and the Pacific surf on the other, and intersected by numerous rivers, Ostinal Beach on Costa Rica’s Nicoya Peninsula is one of the world’s most famed “arribadas” beaches. 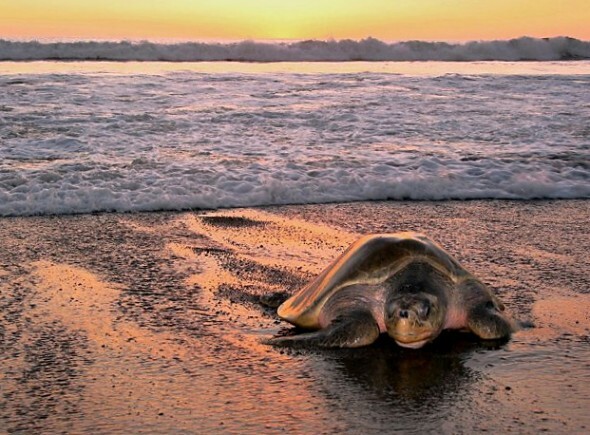 Here, four to 10 times a year between July and November, Olive Ridley turtles trundle ashore by the thousands to lay upward of 80 eggs each before returning to the sea. 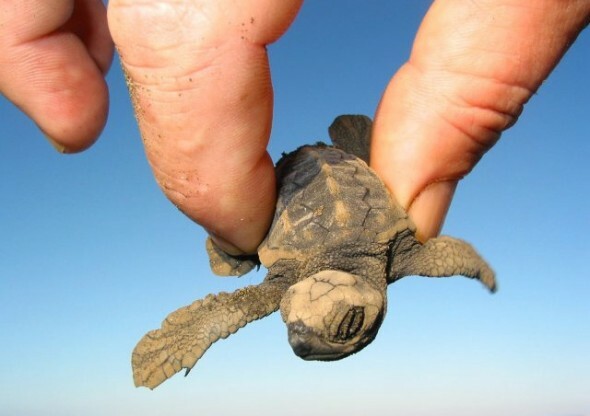 Thirty-five to 40 kilograms in weight and 60 to 75 millimeters in length, an Olive Ridley may be one of the smallest of the world’s marine turtles, but it’s still plenty big enough to stub a toe on. Sure enough, at 10 PM, Jorge had arrived and led us down a lonely stretch of beach. Now our eyes strain for a sign that far ahead, he’s tracked down a Ridley. He has. The light flashes, and we hurtle forward, eventually to make out tracks leading from the sea to the banks of a rivulet. And yes, there’s our valiant mamma Ridley trying to climb the crumbling bank. Programmed to return to the same stretch of beach each year, she has tumbled down the bank several times, unable to reach her destination. Jorge raises her up and over. She hesitates, crawls a short distance, and then seems to know she’s home. She begins to dig with her back flippers. This airline has daily flights to Costa Rica’s capital of San José through Houston airport with connecting services from Vancouver and Toronto, Canada, via Air Canada. Non-stop service to San José from Atlanta, Georgia, with connecting services from Canadian and American cities. Check out Casa Romantica, located close to the beach.